Comments - Terrific triptych illustrating Yoritomo's daring nighttime attack on the Yamaki Mansion in 1180. 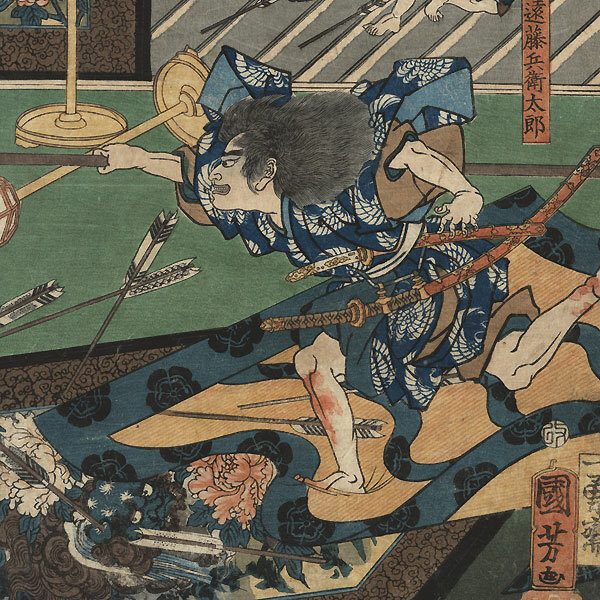 Taken by surprise, Taira no Kanetaka (at left behind screen) and his men are caught in their robes under a hail of arrows as Endo Hyotaro and Katoji Kagekado charge forward with spears. One is dressed in full armor and battle helmet, while the other wears only a kimono and is barefoot. His loose hair streams out behind him and his face is tinged with blue, a sign of his impending death as he bleeds from wounds to his leg and feet. 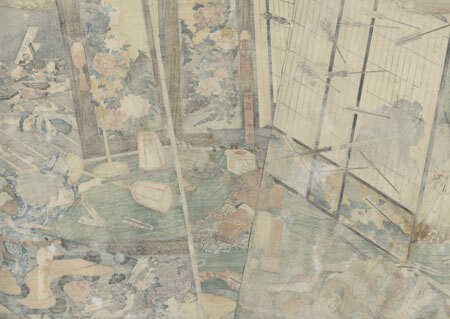 Other warriors lie wounded or dead in crumpled heaps on the floor and verandah. A dramatic scene from this 12th century historic event with terrific details in the fine palace setting and expressive figures. The Boston Museum of Fine Arts has this image in its collection. A great subject for a samurai enthusiast. Condition - This print with excellent detail as shown. Three separate panels. Slight paper remnants on reverse from previous backing. A few wormholes, repaired. Slight toning and soiling, slight rubbing at edges, a few slight ripples. Please see photos for details. Good overall.